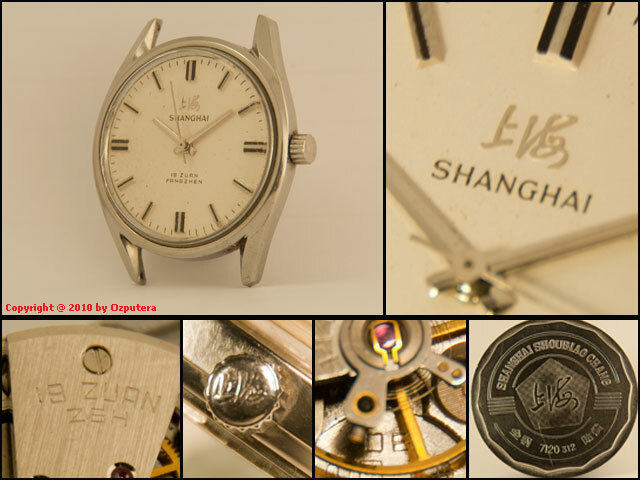 Shanghai Watch Factory launched its first standard movement ZSH in 1974 and millions of 7 series models were produced using this standard movement between 1974 and 1985. This 7120 was one in the series. 7120 watches have many varieties in details such as dials,hour markers, hands, lettering styles,and styles of cases.The 3 digit suffix to the 7120, represents the watch design. The look of 7120 is very similar to 1524 model (see my 1524 post here), a quick way to identify them is that, on the dial of 1524, it is always marked as 17 jewels and on 7120's 19 jewels. Likewise is the marking on the case back of these models. ZSH is a standard movement (统机) of China and was known as SS7 in early 1970's. “Z” stands for ZhongGuo or China (中国), “S” for Shang and “H” for Hai (Shanghai 上海). Below of the balance wheel of the movement, there is “中国上海”and also date code “DE". “D” represents fourth year production from 1974 which is 1978 and “E” means May. So it was produced in May 1978. This 19 jewel ZSH is a 21600 bph movement and has been running well. 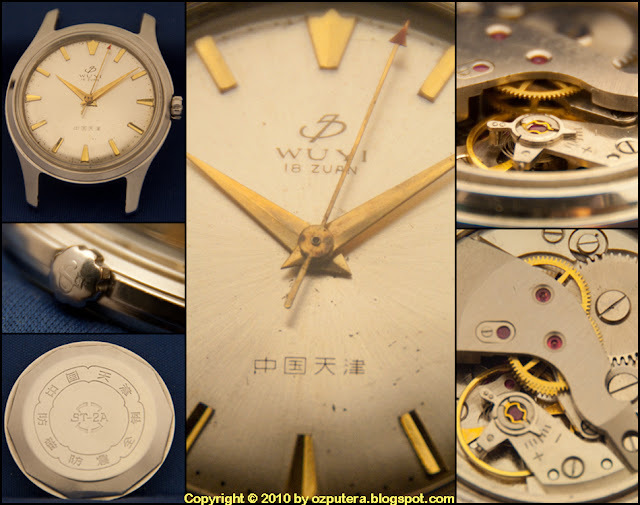 According to this website, for 7 series in 19 jewels, the earliest batches of production had pinyin wordings on the dial (located above 6 o'clock), i.e. "19 Zuan"(19 Jewels), "Fang Zhen"(Anti-Shock) and "Zhongguo Zhizhao"(China Made). Later, the batches in the middle term used only "19 Zuan" and "Fang Zhen". And, from 1980 onwards, they were all spelt in English, i.e. "19 Jewels" and "Shock Resistant". It is known among the collectors that fake 7120 existed as far back to the time even when the 7120 was in production. The price of a 7120 was not cheap and one had to have a "watch coupon" plus a recommendation letter from the employer in addition to cash in order to purchase such watch. For more information on this interesting topic, see this link. This market imperfection had motivated the fake productions which were sold at three to four time lower price than the genuine 7120 with no such coupons needed while still fetching profits. These fakes were made by smaller factories with movements of usually inferior quality. One convenient way of identifying fake 7120 is to visually inspect the quality of the stamped pattern surrounding the word ”上海“ at the middle of the case back that the fake ones are with rougher pattern. The other way is to open up the case back to see whether there is an O ring slot for the O rubber seal; it is said the the genuine 7120 would always have that ring slot. However, these identification methods or criteria are by no means conclusive.